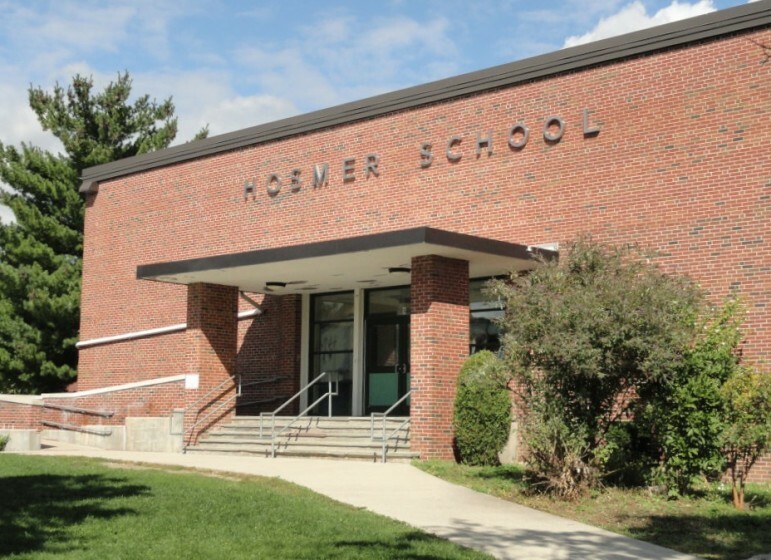 Hosmer Elementary School could get a completely new school building if the Watertown School Building Committee finds the cost is reasonable compared to renovating parts and adding a new classroom building. The Cunniff may also get a new school building. The option of building new buildings at two Watertown’s three elementary school appears to be back on the table, after Town Council President Mark Sideris announced that they may fit within the town’s budget during Wednesday’s School Building Committee. Originally, the School Building Committee previously went in the direction of renovating the current schools and putting on additions at Hosmer and Cunniff elementary schools to save money. However, the cost estimates for doing so has risen significantly. Sideris and Town Manager Michael Driscoll discussed other options, and decided that the possibility of building new schools may be within reach, Sideris said. The decision came after hearing from parents and neighbors of the schools, many of whom worried about the loss of green space with the proposed school expansions. The difference in cost of doing new construction and renovating with additions is not as big as previously thought, Sideris said, plus the schools could save money on maintenance and reap cost savings from more energy efficient buildings. Town officials plan to pay for the three elementary school projects using money that had been going toward paying down the town’s deficit in the pension and retirement benefits, and put it toward the school projects. This would mean no debt exclusion override would be required to pay for the construction. Driscoll announced the plan in October, and used a cost estimate that the project would cost $80 million to $120 million. Those estimates, however, were based on projects made in 2016 by design consultants SMMA. When current project architects from Ai3 did more detailed cost estimates in the spring, the cost rose to $170 million to $180 million. In an effort to cut the costs, Dunlap came up with a new plan to save money by staggering the construction projects and using the current classroom building at Hosmer (due to be demolished after the project) as swing space. Students from Cunniff and Lowell would move into the old classroom building at Hosmer while their schools are being renovated. This would mean the school district would not have to lease modular classrooms and put them on the school sites. The plan also called for no completely new buildings, but would have a new classroom building at Hosmer, a new classroom wing at Cunniff and smaller additions at Lowell. While the cost of the project was reduced, the most recent estimates presented to the School Building Committee in November put the estimated price tag at about $153 million. To get any money above and beyond the $120 million pledged by Driscoll, Sideris said, the School Building Committee would have to make a request to the Town Manager for the additional funding. Sideris said he recently met with Driscoll, and when they looked at the price of building new schools vs. the current renovation plan with additions, the cost difference was not so daunting. During community meetings at Cunniff and Hosmer in November, residents said they worried about how much green space would be lost with the new additions. At Cunniff, Dunlap said the proposed addition in the back of the school would eat up about 40 percent of the playing field behind the school. At Hosmer, the plan called for adding a new school building to the current cafeteria/gym building. This would go on part of what is now the playing field and playground between the school and Mt. Auburn Street. By tearing down the cafeteria/gym area, the school could be built in a way that makes more sense on the property, and preserves open space, Dunlap said. Sideris asked Dunlap to come back at the next School Building Committee meeting with some cost estimates for building new schools at Cunniff and Hosmer schools. The next meeting is tentatively scheduled for Jan. 2, 2019. Dunlap said he and his staff could come back with some cost estimates for two new schools, but would not be able to present detailed drawings of what they would like. School Committee Chairman John Portz said he is excited about the possibilities with a new school. Superintendent Dede Galdston agreed, and said that it would allow the school to be optimized to provide 21st century education to Watertown’s students. School Committee member Lindsay Mosca worried about getting peoples’ hopes up about getting new schools if it is not a realistic option. Sideris said that Driscoll would not have agreed to consider it if it was not achievable and within the possibility of the Town funding it. He added, however, that it is not a done deal. Lori Kabel, director of Public Buildings, said she is worried that the School Building Committee could go in circles deciding whether to do new buildings or to renovate and the schedule would get way off track. Watertown’s third elementary school, Lowell, would still be renovated. The School Building Committee decided to preserve the historic school building on Orchard Street, and to make four small additions to the current school. At the recent Lowell community meeting residents of Carlton Terrace complained that the addition on the west end of the school would tower over their homes, blocking their view and sunlight. Town Councilor Vincent Piccirilli suggested that the addition, which includes four classrooms, some bathrooms and a learning commons gathering space, be moved over slightly to the front of the school. This would increase the distance from the corner of the building to the neighbor’s property from 20 feet to about 40 feet. Another discussion at the community meeting was about parking. Residents opposed putting in new parking spaces along George Street, or a new lot on the field in front of the school. They contended that there is plenty of parking on the street where staff could park. Mosca said the parking should not be thought of as additional parking, but replacement parking for lots that will be lost when additions are built on the location of the lot on the east side of the school. Lowell Principal Stacy Phelan spoke to her staff after the community meeting and they were concerned about not having dedicated parking. She noted that when teachers arrive before school there are still many vehicles on the street, because people have not left for the day. Sideris added that the teachers would still be subject to the two-hour parking limit, and if someone called police about vehicle parking a driveway all the vehicles on the street would be ticketed. One suggestion was to put more parking across Lowell Avenue from the school. Dunlap said not that only about six spaces could be created on that stretch. Others suggested creating street parking along the north side of Orchard Street. Another idea was having teachers park across Orchard Street at the Public Works Facility. Town Auditor Tom Tracy said he does not think that would be an option, noting that he has often gone to the DPW for meetings and found little or no available parking. Very nice summary of the meeting. Another suggestion last night was to provide parking for Lowell School teachers at the Victory Field parking lot diagonally across Orchard Street, which is reportedly mostly empty during the day. There wasn’t a response to that suggestion last night. Seems like it could be a solution to the teacher parking issue. Sad, 13 years ago some of us warned that we’d need more classroom space and new schools. That was one of the reasons we opposed tearing the Browne School build the Police Station. And we very much supported a new Police Station. We just felt it would have been wiser to take the what is now the Santander Bank Building by Eminent Domain. Obviously the Brown was an old building. But there was plenty of room to build a state of the art school there. The other School Building available at the time was Coolidge. The Town decided to lease that property at the time for $55,000 per year and it was turned into apartments for those 55 and older. The Atrium School that was renting the Brown was paying $200,000 a year… They fudged the figures to make it look as though the Coolidge Lease to Mitchell Properties was more valuable. … That lease money could have gone a long way towards paying off the Bond Issue to buy the building I mentioned above. AND WE’D STILL HAVE A LOCATION for a School. To add insult to injury, The Atrium School eventually bought another property in Watertown that was paying $50,000 a yr in taxes. Now as a School it pays nothing. So we took $55,000 per year for Coolidge, lost $250,000 between lost rent and tax revenue… And now we are trying shoe horn extra classroom space and talking about diminishing the size of playgrounds.